One of the great things about home automation technology is that there is always some new advance that allows us to do something that we previously only dreamed was possible. One of our favorite examples of that is the development of the high-definition video doorbell, called Skybell. Skybell is a high-definition video doorbell that allows you to enjoy new levels of security, as well as control and convenience – no matter whether you are right here on Oahu or anywhere else in the world for that matter. It allows you to receive alerts when someone is at your door and also see who is there, all through an app on your smartphone. It even has two-way audio, which enables you to have a conversation with visitors at your door from your iPhone or iPad. Here is why we love it so much. 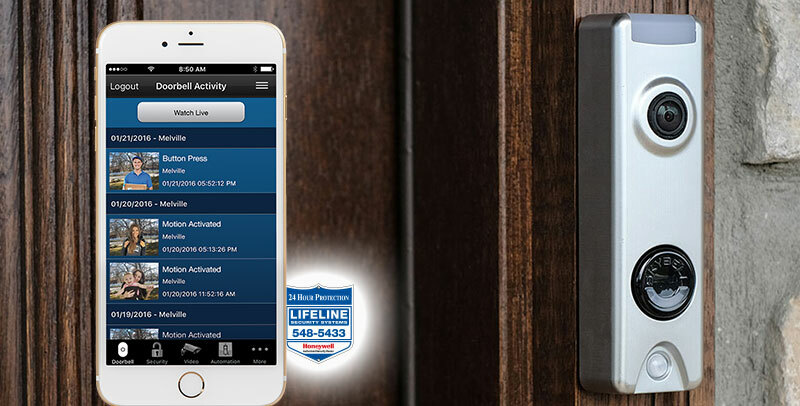 Best of all, the new Skybell HD video doorbell is fully integrated with your existing Total Connect remote services security app from Lifeline. This means you can view who is at your door, talk to them, disarm your system and even unlock the door and turn on a light for your visitor if need be – All from one app! Skybell has full color night vision so you can feel safe knowing you can view visitors at night in color HD. When your doorbell rings, you can answer it and have a full two-way conversation with your visitor from wherever you are. You are able to see who is at the door, but they cannot see you and so they assume you are on the premises. This is especially helpful since burglars often use the doorbell to determine if anyone is home before trying to gain entry. Not only can you use the Skybell as an extra live feed video camera monitoring your home’s exterior, you can also record events in full HD and store the recording for later. Skybell is motion activated, therefore even if the person does not push the button and simply comes near your door, it will send an alert to your phone/tablet and you will be able to see them in full HD color and therefore know about and be able to address the situation. Lifeline Fire & Security is a the only authorized Honeywell dealer in the State of Hawaii and is a premier provider of monitored home alarms and commercial security systems throughout Oahu. Whether at home or on the go, we at Lifeline feel this highly functional Skybell with its modern and attractive design is a perfect addition to any home security system. Contact us today for a free consultation and special upgrade offer on this exciting new technology for your home security system.